America has given the world many things, but fried food served with remarkable speed and consistency is definitely up there as far as greatest contributions go. We've pretty much mastered it by now, so competition is steep for the best speedy version of every cuisine. But still, a few rise to the top as the most beloved. And a recent study told us exactly which ones Americans love best. Market Force Information recently released a new large-scale consumer report about America's favorite Quick Service Restaurants (aka fast food) in five categories: burgers, sandwiches, Mexican, pizza, and chicken. To accomplish this, it polled nearly 11,500 consumers to assemble a study that focuses on a Composite Loyalty Index, which is basically a love-o-meter based on overall satisfaction and likelihood to refer the restaurant to others. The winners were In-N-Out for burgers; Wawa for sandwiches; Chipotle for Mexican; Pizza Ranch for pizza; and Chick-fil-A for chicken. As you probably noticed, the most surprising thing is that America's favorite sandwich shop, Wawa, is a convenience store. Jumping four places to unseat Firehouse Subs in the top spot, Wawa is primarily an East Coast thing, but it has 790 locations, a cult following, and a delicious Thanksgiving-themed sandwich called The Gobbler. The other chain you might not recognize is Pizza Ranch, which is based in Iowa and has 200 locations in 13 states. Despite all the sickness-related press in the last few years, Chipotle still managed to claim the top stop in Mexican food. Probably less surprising is the dominance of Chick-fil-A and In-N-Out. Chick-fil-A led the chicken flock for the fourth year in a row, cited in particular for its excellent food and service, while KFC came in dead last of the 10 chicken chains surveyed. 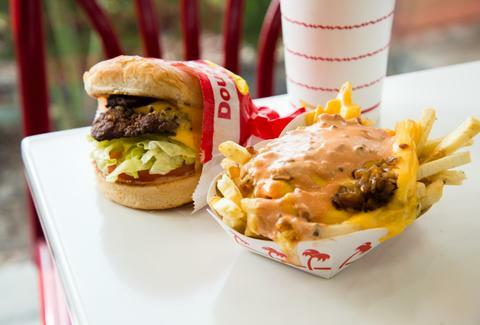 The West Coast burger chain In-N-Out landed an unsurprising first in the burger category consider its insanely devoted fan base and general sterling reputation. It was had the overall score of all the restaurants in the study in all categories. And supposedly working at In-N-Out is great too. But all fast-food categories performed worse on the Composite Loyalty Index this year. “We attribute this to two factors: consumer expectations of the QSR experience are rising, and, in many cases, execution at these restaurants is declining," said Brad Christian, chief customer officer at Market Force Information. "As our research continues to show, delighting guests by providing an exceptional customer experience is a key differentiator in an incredibly competitive environment." However the country feels about these fast-food chains, these results certainly aren't going to quite the rest of the country's demands for In-N-Outs near them.